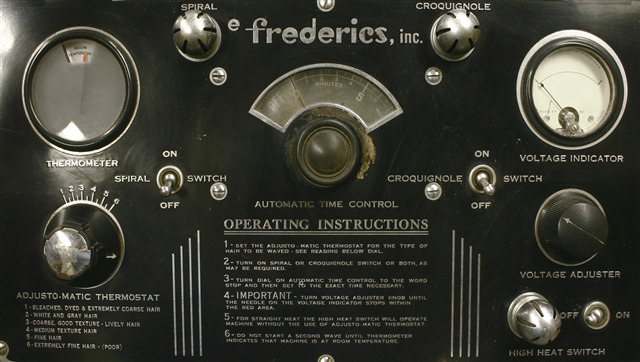 Frederics permanent wave machine used in Crisella's Beauty Shop in Blanchardville, Wisconsin, late 1930s. Prior to the twentieth century, a woman with straight hair who desired curls had to spend hours heating curling irons over a flame or sleep with rags and pins in her hair in order to achieve waves. If she could not attain the desired result this way (or tired of the short-lived effects) she may have used false hair pieces instead. 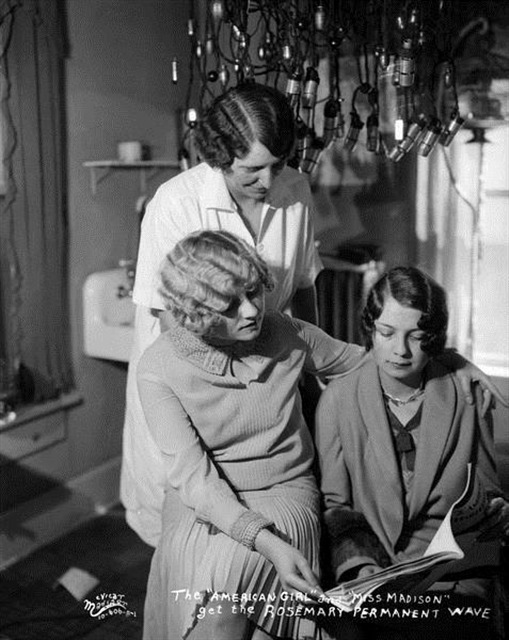 But beginning in the 1920s, women born with flat locks saw new hope for attaining long-lasting curls. 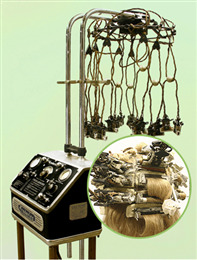 Through the promise of science, rather daunting contraptions like this late 1930s permanent wave machine offered "permanent" results via a combination of chemicals and electrically heated clamps. By the time Crisella Larson opened Crisella's Beauty Shop in Blanchardville, Wisconsin in 1936 and purchased this machine, the permanent wave had been en vogue for nearly a decade. 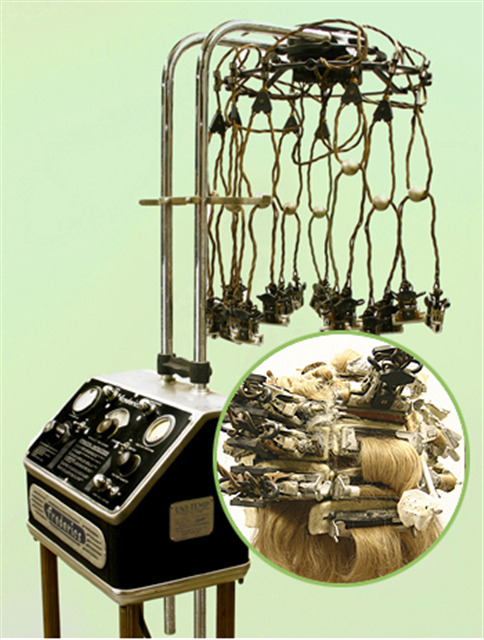 German inventor Charles Nessler had tinkered with the idea of chemically altering human hair years earlier and actually patented his machine in 1909, but the permanent wave did not take hold until the late 1920s, when a combination of modified hairstyles for women and the demise of the fake hairpiece spurred a new desire for a more "natural" wavy style. Liberal minded young women of the 1920s increasingly chopped off their conservative long tresses in favor of short, sculpted boyish styles. But since straight bobs did not necessarily flatter everyone, curly hair became another popular option. Close and dramaticly sculpted waves and tight curls remained some of the trademark looks of the 1920s through the 1930s. Nessler had designed his machine for the hairstyles popular in the early 20th century, but the drastic reduction in popular hair length of the 1920s made his original design, which required long hair to spiral around the rod, useless. Czech hairdresser Josef Mayer developed the croquignole method in the 1920s, which proved practical for shorter hairstyles. Using this technique, a stylist would wrap hair from the end of the tresses up to the scalp. It took all day, and cost $1 each….First our hair was washed and cut, then we waited and waited. There were women everywhere in different stages of getting beautified. Everyone was waiting….My hair wound up on spiral rods so tight that I thought I would never blink again [and] after the machine that looked like a milking machine was attached to the rods, I couldn't move. [Then] it began to steam and tears rolled down my checks. …[finally] someone got a blower and cooled my head here and there, but my scalp was scalded. In the end, Kanan described her hair as a blonde "haystack." Because of frequent mishaps like this, some hairstylists referred to permanent waves as "pocket perms," a term that poked fun of the fact that the drastic chemical and temperature measures of their equipment often caused a client's hair to break off during the process. In the hopes that a client would be none the wiser, the stylist would sometimes hide the broken tresses in her pocket. While women's garments were comparatively less fussy and stylistically simple in the 1920s and 1930s than in the preceding decades, certain beauty routines like the permanent wave and facial make-up grew increasingly elaborate. Both magazines and the movies featured glamorous new role models to popularize "Modern" standards for beauty. 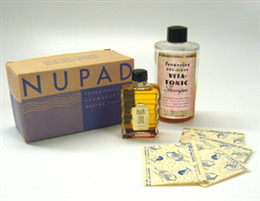 The rise in popularity for all sorts of new and complicated beauty rituals led to a huge growth in salons. While in 1920 beauty parlors numbered around 5,000 in America, by 1930 the number had exploded to 40,000. Even the Great Depression and World War II could not diminish their popularity, perhaps because certain beauty regimens remained important to the morale of many women during these trying times. By the 1940s, "cold waves," which relied only on chemicals and not heat for perms, gained in popularity. Home permanent kits also grew increasingly popular, but the threat of hair "disaster" remained ever present, causing many women throughout the 20th century to seek the expertise of a more experienced hairdresser in hopes of avoiding such catastrophes.